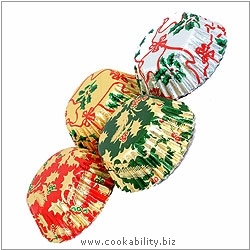 Foilcraft Christmas bun cases in festive holly and ribbon multicoloured prints. Approx 8 of each design. Supplied in a polypropylene container for easy storage. Dimensions: 45mm base x 25mm high. Colours may vary.